In the northern Golan, near the Jordan River, there is an attractive nature park of which ancient Tel Dan is the literal highpoint. This fertile station on the ancient caravan route from Egypt to Syria is fed by one of the tributaries of the Jordan, the Dan Spring which flows down from Mount Hermon. The spring pours out 250 million cubic meters per year. The city had until then been called Leshem or Laish, and under this name it is also mentioned in ancient Egyptian texts already from the 19th century BCE onwards and also in Mesopotamian texts. In ancient times, Laish was already a mighty city with bulwarks. It was during this time that the patriarch Abraham and his men pursued the northern kings who had captured his nephew Lot as far as Dan (according to Genesis 14:14). Although the tribe of Dan settled the tel in the 11th century BCE, they did not leave any archeological remains. The city became prominent only after the death of King Solomon (928 BCE) when Israel was divided into two kingdoms. The king of northern Israel, Jeroboam, who wanted to avoid his citizens’ pilgrimages to the Temple in Jerusalem, erected two golden calves for his people to worship. He said that these were their new gods, and put one statue in Beit-El, the other one in Dan (I Kings 12:28-9). These two cities marked the northern and southern borders of his kingdom. In another development, Jeroboam also added another fortification ring outside the old city wall, which included a monumental gate. This gate was destroyed during the Syrian invasion that the Judean king Asa initiated at the turn of the 9th century BCE (I Kings 15:20). The next Israelite kings, Omri and his son Ahab, rebuilt the battered city, and re-erected the gate and a huge podium at the north end of the tel. However, with the Assyrian invasion (732 BCE) life in Dan came to a halt, although Dan is not mentioned in an Assyrian victory account. 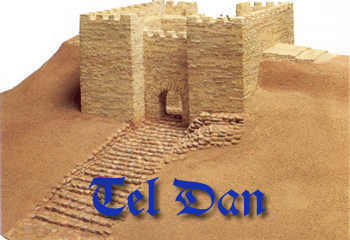 It is probable that Dan’s inhabitants were banished together with the other northern Israelites (II Kings 15:29). From about the 4th century BCE life returned to the city. It remained inhabited until the 4th century CE, but nothing much is known about Dan from this period. The Jewish historian Josephus Flavius mentions Dan in his accounts and confirms it is the site of Jeroboam’s golden calf (The Jewish War, 4:3). There is an exhibition about Tel Dan in the Skirball Museum in Jerusalem, from which as much may be learned about Dan as during a ‘real’ visit to the north. In addition to pictures of the excavations, there are models of the gates, the holy quarter is reconstructed, and figurines and artifacts show what life was like at the tel. Also the Ussishkin Museum, in Kibbutz Dan, has a good collection. From the parking area, in order to get a sense of chronology, it is recommended to first walk to the farthest lying gate house. This gate is the only Bronze Age arched gate that survived complete in the entire Middle East. It is dated to the 18th century BCE, and when it was dug out it reached almost to its original height of 7 meters. It was built of sun-dried mud bricks that used to be covered with white plaster. There are three arches. Stone steps lead to the first gate. The middle gate is covered by a square building. The third gate leads out to a flight of steps down into a street. The gatehouse as a whole was part of a huge earthen rampart with a stone base that enclosed the city; later it was covered with earth, whereby it was preserved. Estimators think it cost 1000 laborers three years to shovel earth on the 1.7-kilometer rampart. The second gatehouse, which dates to the Israelite period (9th-8th century BCE) and was built by king Ahab, lies more to the west. The entrance slope led from east to west to a large square gate. The behind-lying building was multi-gated, with seven towers and many different rooms. After a courtyard there is another gate to a covered rectangular building which comprised four rooms. From this a wide street leads up to the city, which is protected on its southern side by a high city wall. In contrast to the Canaanite gatehouse, the Israelite gate was not built on top of the rampart, but halfway down. In the northwest of the courtyard archeologists found a platform; maybe this was used to put a throne or alternatively a statue. At its corners were beautifully carved stone bases in the shape of petals that supported the pillars of a canopy; the style of these bases comes from Syrian examples. Also the city elders held sway in the gatehouse, according to several Bible passages (Genesis 23:17-19, Deuteronomy 20:19, Ruth 4:1-2). They probably sat on the stone bench next to the throne platform, with their backs resting against the wall. The elders listened to pleas that were brought to their attention (Amos 5:15, Zachary 8:16). In this pre-email era the gate was also the place to indulge in gossip (Psalms 69:13) and news about the big world outside. From II Kings 23:8 we gather that the gate acted as a cult place. This corresponds to another discovery in the square, of five flat cultic stones or massebot, which had an altar-like long table in front of them. King Josiah, who reformed religious practice in Judah, condemned the ‘high places at the gates,’ and smattered them to pieces, but northern Israelite kings were less strict. King Omri and his son Ahab famously dabbled in heathen, especially Phoenician, imported gods. At the other end of the street, there is an inner gate, which was built at a later date. It is located in the core of the Canaanite rampart. The street pavement leading to the newer gate had been polished by thousands of foot troddings. In the square of the Israelite gatehouse an inscription belonging to a large basalt slab was found in 1993, making international headlines. It is unique for several reasons: because it is very old; dating to the 9th century BCE, and because it’s the very first time that the house of David is mentioned in a text outside the Bible. The fragment formed part of the victory stele of king Hazael of Aram (Syria) and is written in Aramaic. It is the only monumental inscription that has been found in Israel so far; apparently the kings of Israel and Judah did not make victory monuments of their own. However, one eminent Hebrew expert of the University of Rome thinks the inscription is a forgery. He says the slab mentions too much information about Israelite kings and not enough about the Arameans, and the inscription itself is written in ‘odd’, Hebrew-accented Aramaic. Also it was found in too perfect a state; what is more, the Arameans never wrote inscriptions on steles but on statues, all of which makes it suspicious. He thinks the inscription was manufactured for ideological reasons: to furnish a reference to the house of David outside the Bible – to prove the Bible true. The slab numbers 13 lines of a larger story which describes the victory of Hazael over Israel and Judah (the house of David) at the beginning of his reign, and that he killed seventy kings, among whom king Yehoram of Israel and king Ahaziahu of the house of David. These events correspond to the Bible story in II Chronicles 22, but according to II Kings 9, these specific Israelite kings were murdered by king Yehu of Northern Israel. Other parts of the same stele were also found scattered in the same location; they were used as filling for a new wall. 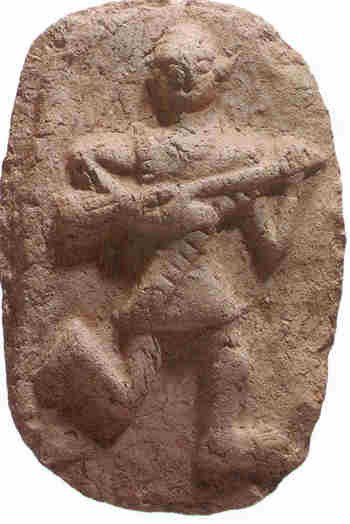 Experts suggest that a later king of Israel deliberately smashed the stele in the courtyard of the gate; maybe this was Yehoash, the grandson of Yehu, who fought against the Arameans and attacked Ben Haddad, the son of Hazael, three times. Others say that Ahab, several generations earlier, would have smashed it. It is not known what the role of the city of Dan was in all this. In the Bible it is related several times that the Syrians conquered ‘the cities of Israel’ and later the Israelites acquired them back. Dan is not mentioned specifically. The cult area is divided into a high and a low place. 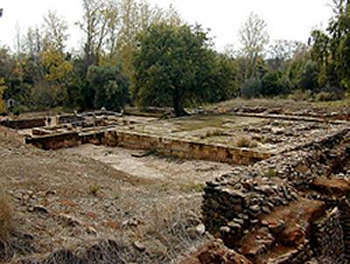 The low place was a simple room with two doors on either side and a horned altar in the middle, dated to the 9th-8th century BCE. This kind of square altar, made of a single block of stone with horns in all four corners, was also found in other Israelite sites. On top of it there were burn and soot marks made by incense that sanctified the animal offerings. Stairs lead up to the sanctuary or bamah, which consisted of different rooms and a courtyard. Also the fountain rooms were placed here. The wooden beams in the walls are a modern reconstruction; the wood was burnt during the Assyrian destruction. Some say that the wood beams are reminiscent of Solomons Temple in Jerusalem: “with three courses of hewn stones and one course of cedar beams. (1 Kings 6:36; 7:12),” except that here of course the holy place was dedicated to idol gods. In the altar room there were two stone square altars and three metal incense shovels – the only ones that were found in Israel from the Iron Age. They were used to remove ash in a jar that was sunken in the ground. There was also an iron incense holder engraved with a star. 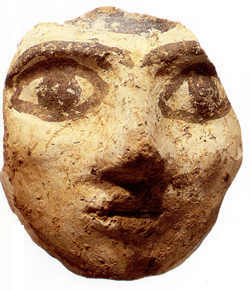 In the museums there are copies of small figurines that were excavated in the cult area. These are in the Egyptian/Phoenician style and show the heathen gods that were worshipped in Dan. 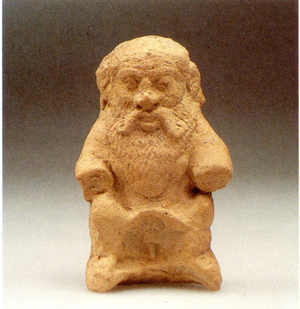 There is a statuette of the god Bes, looking gnome-like with a long beard, and several depictions of the ancient fertility goddess Astarte. The oldest little sculpture is of ‘the dancer of Dan’ and dates to the 14th-13th century BCE. There is also an abundance of ancient pottery. Some huge jars resemble ones that have been found in other Israelite settlements of Shiloh and Gilo. Some smaller jars have a seal of the king in their double handles. In the sacred area stood two identical, particularly large vessels, called snake pythos, because a large snake coils round its belly. The snake was a symbol of fertility and also of the gods, (witness the Bible story about Moses’ snake staff). A rich reservoir of Canaanite artifacts was discovered in burial tombs at the south side of the earthen city rampart. They were built of stone slabs and sealed by a large stone. Their entrance lay to the south. The dead were buried together with pottery chalices, small pitchers and cups, bronze daggers, toggle pins of silver and bronze, Egyptian scarabs to ward off demons, and cosmetic boxes with bone inlay. Check out our latest insurance quote written by our teams to help you in real seiko watches & pulsar watches. You can also enjoy ebel watches on vacations.